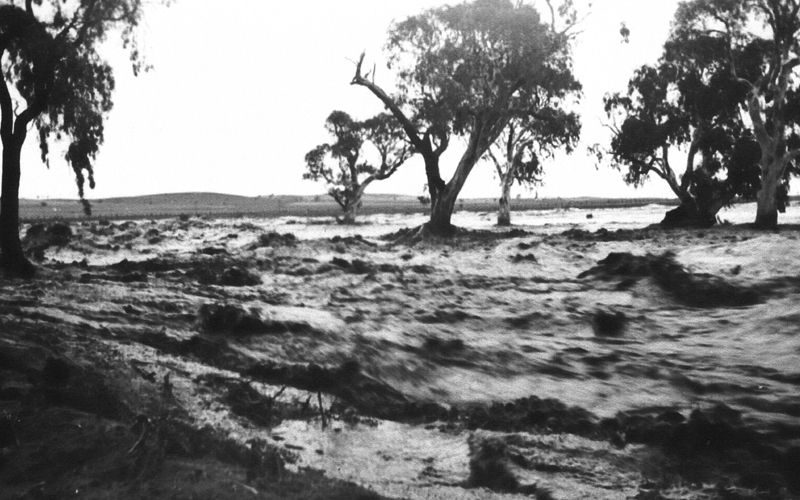 The Becker farm near Laura straddled the Pine Creek about four kilometres north of Laura on the Laura to Appila road. The Becker homestead, known as ‘The Willows’, stands on the bank of the creek in line with a spot where the Pine Creek takes a bend. 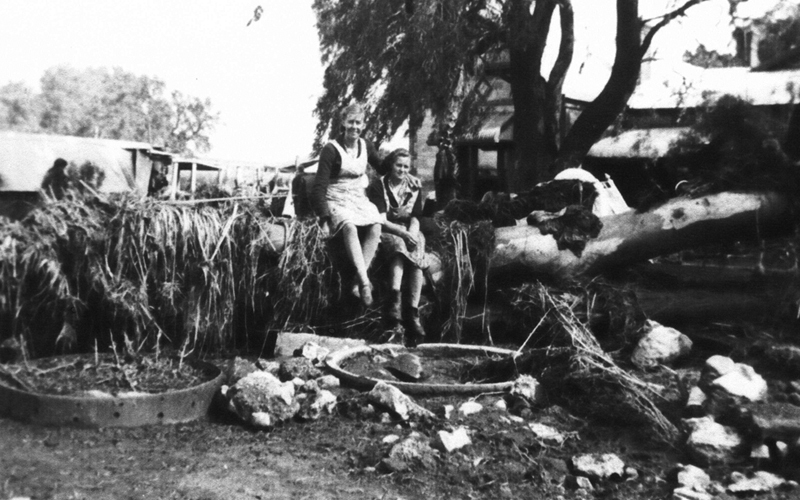 In 1941 raging flood waters swept round and through the homestead. 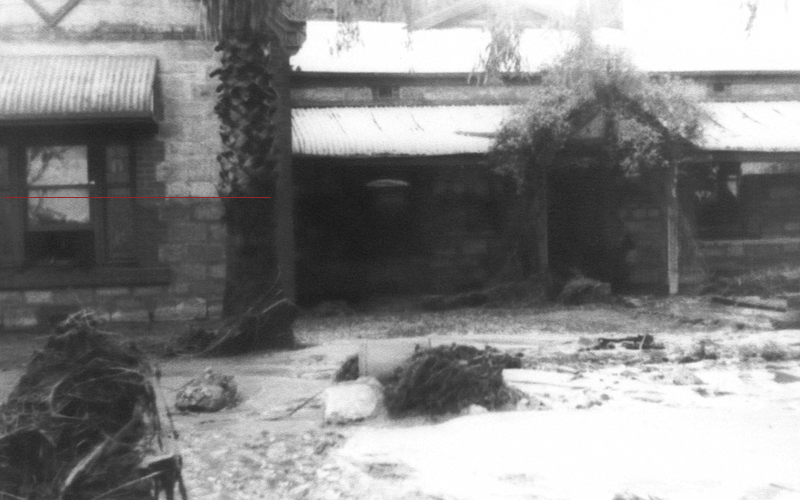 “In January 1941 I had the following experience with flood waters which went through my Grandmother Becker’s house. I was 8 years and 2 months of age. I was staying at my Grandmothers during school holidays. There had been constant heavy rain from evening and through the night. Tarcowie, which is about 25 km north from here, had about 140mm rain where the Pine Creek has its beginnings. The phone began ringing early in the morning, that there were a lot of flood waters coming our way. The real problem for us began when a timber bridge (Cowins) collapsed and the debri came against a more substantial bridge further down stream (Stakers). As the pine creek was already running a banker plus debris, this bridge also collapsed, sending a huge surge of water downstream, which caused all sorts of problems. I was in one of the bedrooms watching through the window as water was building up outside. After a while I realized things seemed quiet so decided to find out where everybody was. As I left the room and entered a passage, suddenly there was this great crashing sound and the weight of water had pushed open the front door and came rushing. I hastily retreated to the kitchen only to find I could not get out, because the water rushing past outside was putting so much pressure on it from outside, I could not push it open. Fortunately someone outside, (I think Clem Zanker) heard me banging on the door, opened it and took me to a stone wall garage ceiling where we stayed until the waters receded. The water went through the house and shed at a depth of approximately 1.5 metres. From our refuge we could watch all the debris going past, which was mainly pig sties and chook houses plus their contents of pigs and fowls. I do not recall what happened to them or whether any survived. Several items including a 3 wheel bike were found about 1 to 2kms away in neighbour’s paddocks. Sheep yards and sheep dip were also lost. The cellar was also full of water and some mud. There was also a boys room near the house with a cellar. This got filled with silt with several personal items lost. It was never cleaned out. What we had for food, or toilet, I do not remember. There were several large trees deposited, one just stopping short of the house, on the front lawn. I do not really remember much about the clean up or any post flood activity. The red line indicates the depth of the flood waters. Emma Becker was already a widow at this stage and this put extra burdens on her and the Becker family. Her grandson Melville quotes a good outcome. On Saturdays he would ride his bike over to the Weston neighbours and he and Harold Weston would ride on to watch the construction of a new bridge on the Laura – Appila road where another bridge on the Pine Creek road had been swept away. This is still the current bridge, known locally as ‘Cowins Bridge’. The new bridge that stood over the Pine Creek on the Stone Hut – Caltowie road, known locally as ‘Westons’ or ‘Stakers’ bridge’ that washed up on the Becker farm – was never replaced. A level crossing took its place next to it and one can still see the concrete ramparts of the original overhead bridge.